I am very disappointed in myself for the last few weigh in’s because I haven’t been doing the hard work that I have supposed to be doing. I have been eating my Weight Watchers and Lean Cuisine like I should, but I’ve also been saying yes to the tortilla chips and the candy because of Halloween, and I’ve paid the price in calories. I also haven’t been doing the work I need to do at the gym to help me to lose weight. So the gym. I’ve been going to the gym every other day, and I stopped building muscle, but I haven’t been able to do the extra work on the treadmill because every time I get on the treadmill, within 20 minutes of walking I have to urinate, and you’d think I was holding it in for an hour. I have to hurry up and enter the time, calories and distance to the Noom app and run to grab a towel and soak it with Planet Fitness’ cleaning solution and wipe the bar down that I touched during my workout, then walk very fast to the locker room so I can pee. I thought the problem was going away, but it didn’t, and yesterday it actually caused me pain. My life partner Googled the symptoms and he says it sounds like I have a urinary tract infection. I’ve never had that problem before. Am I drinking too much water? Because I don’t drink anything but coffee in the morning and then water throughout the rest of the day, but is it the tap water that is causing the problem? Who knows. I’m going to start buying filtered water. I think my biggest problem is that I am not getting enough sleep. When I lost 70lbs in 2013 I was sleeping, like a lot because I broke my arm, so I was sleeping for several hours during the day as well as at night, so I think that had a lot to do with my weight loss rather than diet and no exercise. This time I thought the weight gain was coming from building muscle, but I don’t think muscle has anything to do with it now, I think my problem is lack of sleep, so I think I’m going to make sure I take the time to take a nap and see if that helps. The main reason I haven’t blogged the last couple of weeks is because I don’t think people really care about my weigh in blogs. So, I think this will be my last one unless something miraculous happens. So if you have been reading, thanks so much for reading my weigh in blogs. 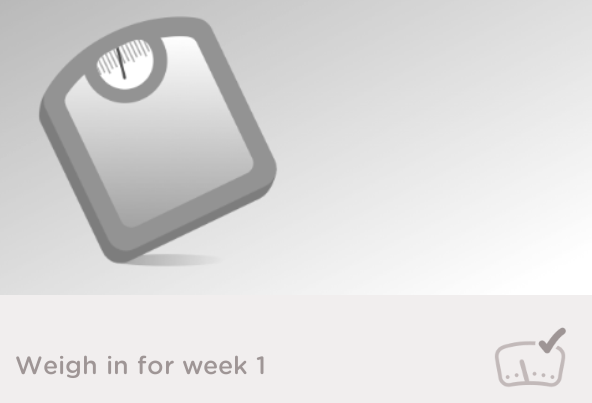 Today was my first weigh in for week 1. I restarted my weight loss program with Noom less than a week ago, but for some reason, Noom wants me to weigh in twice a week and today was the first weigh in. I started out at 238 and today I was 234.6. I was actually 240 before I began my weight loss program, but I had already dropped 2lbs by the time I started, but I can’t count that. So as it stands I have lost 3.4lbs. That’s good enough as far as I am concerned. You are only supposed to lose 2lbs a week, so I’m happy with 3.4lbs. I have been dieting and exercising, except yesterday I didn’t because I follow a routine now. I eat lunch at 12, then wait about half an hour before getting on the bicycle, then I try to be finished by 1:45 so I can get in the shower so I can watch tv with my partner. He likes to watch TV with me from 2pm to 5pm because that gives us time together. If we don’t, then we never see each other because of my video game addiction lol. So there is a reason for a routine. 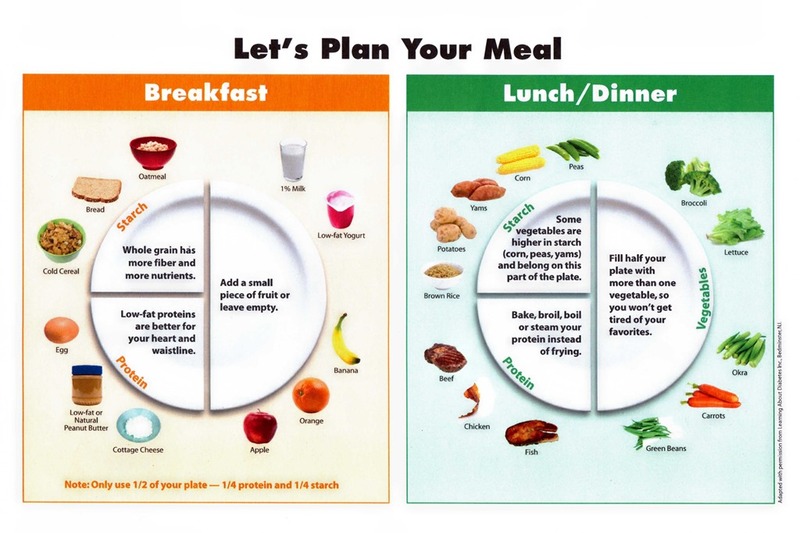 My nutritionist wants me to follow a specific diet where my plate has 1/4 protein, 1/4 starch and 1/2 vegetables. 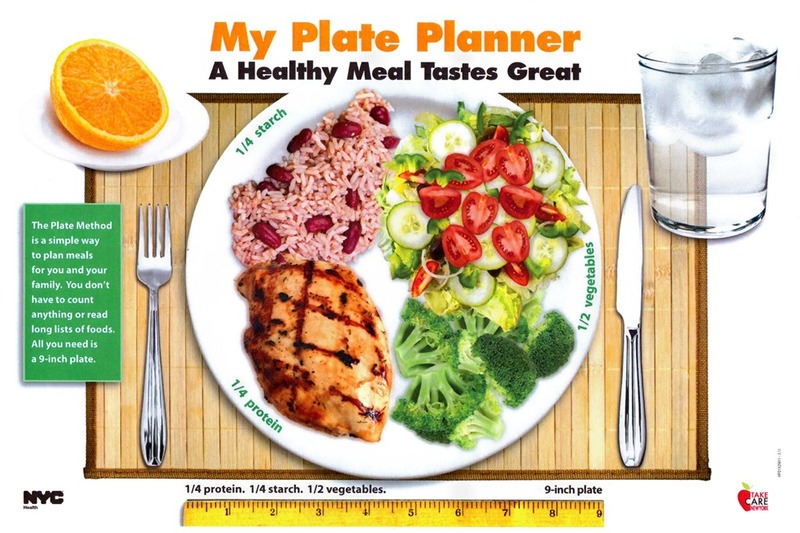 Here are the papers she gave me which shows the plate planner, and breakfast, lunch and dinner. They don’t seem to be too bad. They are actually what SparkPeople wanted me to do, but the thing is, sometimes I don’t want to eat a specific thing. I usually only eat a Weight Watchers frozen dinner which is green in the Noom app. Hey, I lost 70lbs with the weight watchers frozen dinners, so how can I go wrong? I will do my best to eat a healthy diet, but I can’t promise I will be able to fill a plate since I usually just eat my food from a bowl. If I eat pasta or rice and meat and vegetables, I usually mix the entire amount and eat it in a bowl. I find it better to combine everything because it puts sauce on the veggies so I don’t have to use margarine or butter. Oh and I asked her about that, and she told me to use lemon in place of butter. I haven’t tried that yet, but I have a feeling it isn’t going to be the same thing lol. Well, I can’t promise I will eat a 3 or 4 course meal, but I will promise to do the best that I can with what I can actually afford on my disability checks. So far the best option for me is 1 weight watchers frozen dinner for $2 at Food Maxx. It fills me up and it isn’t expensive. I don’t know if I will continue to update my blog every week like I did 2 years ago. Today was my first official weigh in for 2014. When I decided to start my diet up again as my new year’s resolution for 2014, I was 213lbs and I wanted to drop a few pounds before officially starting, so I did and now I am down to 207lbs. See? I’m serious about this! My goal last year was just to get down to 200lbs and I did that by my birthday, but I ended up going down to 193lbs which brought my weight loss to 70lbs. This time I want to get down to 150lbs which means if my official weigh in is 207lbs, then I have 57lbs to lose. I’m not positive 150lbs is the right weight for me since people insist that it’s not realistic because that is way too thin for me, but I’m 5’7” and the ideal weight for my height is 150lbs, and that was what I used to weigh, and I could still pinch an inch, so I wasn’t skinny by any means. Although, I have built up a lot of muscle since I weighed 150lbs, so perhaps 150lbs would be too thin. I don’t know so I will decide when to stop when I get to whatever weight that proves to be too thin. So the image you see above is my weigh in screenshot from the Noom app on my Nook HD+. I will take screenshots every Friday when I weigh in and I will post them on my Noom page. According to the weight graph, I should be at 150lbs by September 28, 2014. Last year it told me that I would be at my goal by September (or was it November? I can’t recall) and I was at my goal by June. Perhaps I will be at my new goal by June again. That would be awesome because that would make the perfect birthday present to myself. 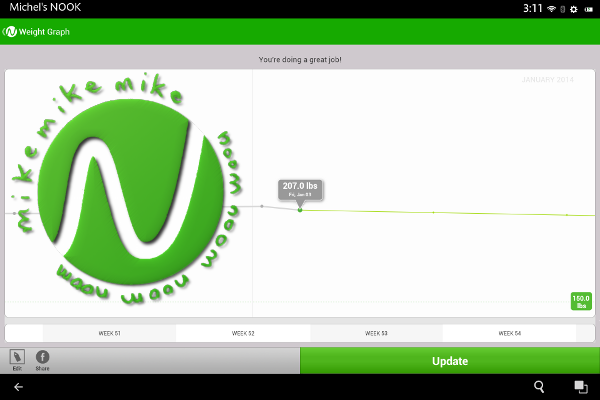 I will be using the waist graph in the Noom app, but I won’t be doing screenshots of it because I think that’s overkill. I mean, most people probably don’t give two shits about my weekly weigh in, so I’m sure the waist graph doesn’t make any difference lol. I barely care about it, but I use the waist graph because it would be neat to know how fat I was in inches from January 2013 when I weighed 263lbs compared to what my inches will be when I get down to 150lbs (hopefully in June). Anyway, I don’t think I will be writing a blog post every weigh-in day, because I’m sure that’s too boring for people. Instead I will just upload the screenshot on my Noom page. I may blog here and there about this and that. So… until then.